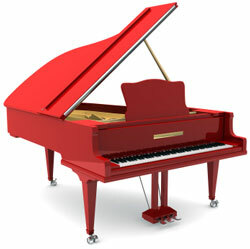 Pianos bring an elegance and class to the homes and establishments they grace. Moreover, many pianos are quite expensive and may be antiques and collectors’ items, which is why finding experienced piano movers in Atlanta is a necessity when it comes time to relocate your Steinway or whatever kind you own. Bulldog Movers has been the piano movers Atlanta residents have counted on for more than 25 years. We only hire experienced, non-smoking employees who reflect the integrity of Bulldog. In addition, we never subcontract our moves, so you can rest assured that men in red shirts that arrive at your home are held to the highest standards. Our team goes the extra mile to protect your valuables, so we offer wooden crating, custom-built to fit the measurements of your pianos, glass tables, chandeliers, pool tables, and more. Whether you have a baby grand in Roswell or a spinet in Marietta, don’t trust your priceless piano to inexperienced piano movers in the Atlanta area. Experience the level of service that has earned us the Consumer’s Choice Award nine years in a row and counting. To make us your trusted piano movers in Atlanta, call or email Bulldog today.